Epigenetic variants broaden phenotypic diversity in eukaryotes. Epialleles may also provide a new genetic source for crop breeding, but very few epialleles related to agricultural traits have been identified in rice. 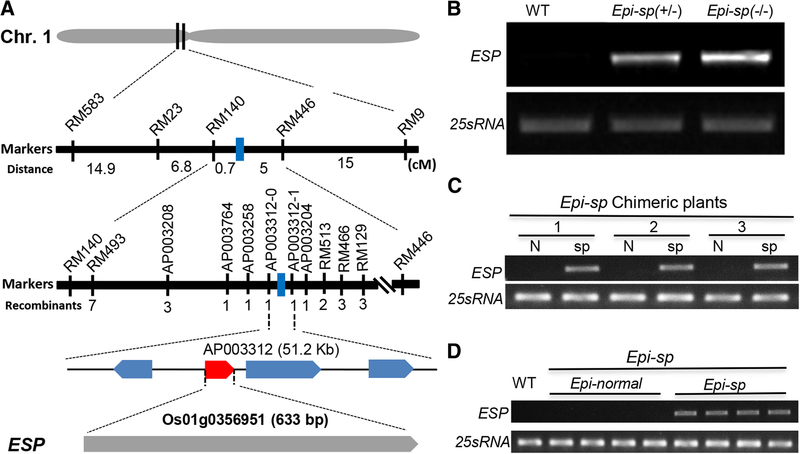 Here, we identified Epi-sp, a gain-of-function epiallele of the rice ESP (Epigenetic Short Panicle, Os01g0356951), which encodes a putative long noncoding RNA. The Epi-sp plants show a dense and short panicle phenotype, an agronomically important phenotypes that is inherited in a semidominant manner. We did not find any nucleotide sequence variation in ESP. Instead, we found hypomethylation in the transcriptional termination region (TTR) of ESP gene, which caused ectopic expression of ESP in Epi-sp plants. Bisulfite analysis revealed that the methylation status of 26 CGs and 13 CHGs within a continuous 313-bp region is essential for the regulation of ESP expression. Thus, our work identified a unique rice epiallele and demonstrated that epigenetic modification of ESP is associated with the regulation of panicle architecture in rice. In higher plants, epigenetic variation provides a mechanism for phenotypic variation in the absence of DNA mutations. Although a number of epigenetic mutants were identified in multiple plant species, including Arabidopsis (Jacobsen and Meyerowitz 1997; Soppe et al. 2000), Linaria vulgaris (Cubas et al. 1999), Solanum lycopersicum (Manning et al. 2006) and Cucumis melo (Martin et al. 2009), examples of epigenetic diversity in rice remain limited. 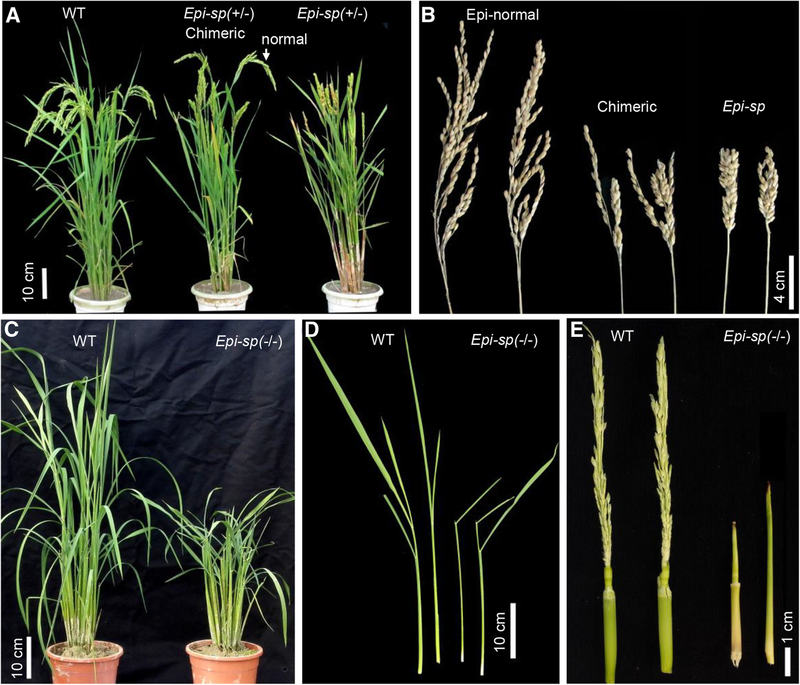 The first epigenetic mutants identified in rice is the Epi-d1, that shows a metastable dwarf phenotype, often producing both dwarf and normal tillers on the same plant (Miura et al. 2009). Metastable phenotype of epi-d1 is due to metastable expression of DWARF1 (D1) gene, which is associated with DNA methylation in the D1 promoter region. Other epigenetic mutants of rice such as Epi-df (Zhang et al. 2012), Epi-RAV6 (Zhang et al. 2015), also show DNA hypermethylation or hypomethylation in the promoter of the corresponding genes, resulting in the suppression or induction of their transcription. Previous studies have shown that epigenetic modifications can affect various aspects of plant growth and development including plant height, seed size, floral development and disease resistance in rice (Miura et al. 2009; Zhang et al. 2012; Zhang et al. 2015; Deng et al. 2017). Panicle architecture, an important agronomic trait of rice, is mainly determined by the number and length of the primary and secondary branches. Although a number of key genes controlling panicle architecture such as DEP2 (Li et al. 2010) and SP1 (Li et al. 2009) have been cloned and characterized in recent years, whether epigenetic modification is involved in the regulation of panicle architecture remain unclear. Here, we identified a natural epiallele of rice ESP and found that plants carrying this epiallele show reduced panicle size, as well as hypomethylation in the ESP transcriptional termination region (TTR) and ectopic expression of ESP. Our work revealed that epigenetic modification of ESP plays an important role in the regulation of panicle architecture in rice. A spontaneously occurring rice mutant with a dense and shortened panicle was isolated from the japonica rice ‘Zhonghua11’ and was named Epi-sp (epigenetic short panicle) based on our subsequent characterization (see below). To determine the inheritance of Epi-sp, we examined the phenotypes of 210 progeny of self-pollinated Epi-sp plants. Three distinct phenotypes were observed. Among them, 58 were normal looking (wild type) plants, 103 displayed shortened panicle, and 49 exhibited dwarf phenotypes (Fig. 1). The ratio of wild type to short panicle to dwarf phenotypes was 1:1.78:0.84 (for 1:2:1 ratio, χ2 = 0.85, P > 0.05). In addition, 35 F1 plants derived from the cross between Epi-sp and Zhonghua11 showed a near 1:1 ratio of wild-type vs short panicle progeny (Data not shown). 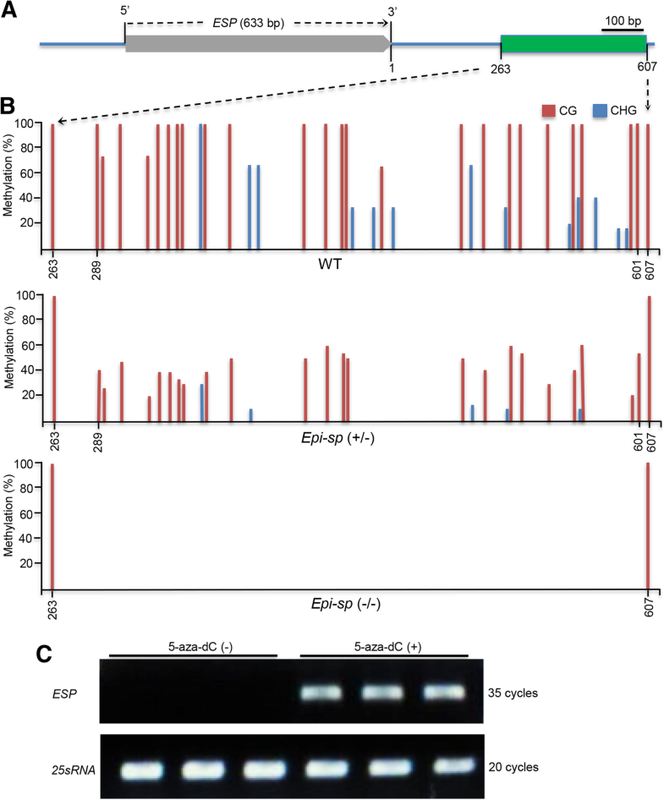 These results demonstrated that the Epi-sp mutant is a heterozygous allele controlled by a single, semi-dominant locus. Thus, the short panicle progeny is referred to as the heterozygotes Epi-sp (+/−), and the dwarf progeny as the homozygotes Epi-sp (−/−). The heterozygous Epi-sp (+/−) mutant showed a significant reduction in plant height (97.4 ± 3.4 cm), compared to the wild-type plants (106.7 ± 3.1 cm), resulting from significantly shortened panicles and branches in the mutant culms (Fig. 1B and Additional file 1: Fig. S1). But there were no significant differences in the number of primary and secondary branches and grains morphology between wild type and mutant plants (Additional file 1: Figure S1). The overall appearance of the mutant panicle is more compact compared to the wild type. By contrast, the normal tillers have normal features (Fig. 1a). Interestingly, the heterozygous Epi-sp (+/−) mutant was often chimeric, producing both dwarf (Epi-sp) and normal tillers (Epi-normal) on the same plant (Fig. 1a). In addition, we found chimeric features also in the panicles (Fig. 1b). This strongly suggests that the Epi-sp mutant phenotypes are not genetically fixed and can vary epigenetically in the developing plant. For the homozygous mutant, it exhibited a dwarf phenotype (24.8 ± 2.8 cm) with a defect in shoot apical meristem (SAM) and could not set seeds in paddy field (Fig. 1c-e). To identify the mutated gene responsible for the Epi-sp phenotypes, map-based cloning method was employed. Initially, linkage analysis with 250 polymorphic SSR markers spanning a 5–10 cM interval on 12 chromosomes was conducted using a small-scale F2 population (80 individuals) derived from a cross between Epi-sp and Huajingxian74 (an indica rice cultivar). Genetic mapping revealed that the ESP locus was associated with one SSR marker RM23 on the short arm of chromosome 1. The ESP locus was subsequently narrowed to a region of 5.7 cM between the RM140 and RM446 markers in 290 F2 individuals. For fine mapping of ESP, insertion-deletion (InDel) markers were designed according to sequence differences between indica and japonica rice. Ultimately, using a large-scale F2 population of 1129 mutant individuals, we mapped ESP locus to a 51.2-kb region on chromosome 1 (Fig. 2a). Within this 51.2-kb interval, there are four predicted ORFs (Os01g0356900, Os01g0356951, Os01g0357100, Os01g0357200). Genome annotation revealed that Os01g0356900 encodes a putative extensin-like protein, partial sequences of Os01g0356951 is similar to flavin monoxygenase-like genes, Os01g0357100 encodes a putative ferredoxin-nitrite reductase and Os01g0357200 encodes a sterol-binding domain containing protein. However, we found no nucleotide sequence difference between the mutant and the wild type in this region. We next investigated the expression level of four genes annotated in the mapped region. Expression analysis demonstrated that the transcript level of Os01g0356951 was dramatically elevated in Epi-sp plants (Fig. 2b), while that of three other genes remained unchanged (Additional file 1: Figure S2), compared to wild type plants. Moreover, Os01g0356951 showed a higher expression in homozygous Epi-sp plants than in heterozygous lines (Fig. 2b). These results suggested that the phenotype of Epi-sp might be caused by the elevated expression of Os01g0356951. To determine the cause of the metastable phenotype of Epi-sp, we performed expression analysis of the ESP gene (Os01g0356951). Although ESP was highly expressed in short panicles of chimeric plants, the ESP transcript was not detected in normal panicles of these same plants (Fig. 2c). We also examined ESP expression in the progenies of selfed independent chimeric Epi-sp plants and found that the ESP gene was highly expressed in Epi-sp but not in Epi-normal plants (the progeny from normal panicle of chimeric plant) (Fig. 2d). These results suggest that the epigenetic phenomenon in Epi-sp is associated with the misexpression of ESP gene. We found no nucleotide sequence difference between the wild type and Epi-sp, but we did observe alteration of ESP expression levels in the Epi-sp plants, suggesting that the mutation may result from an epigenetic modification. We therefore investigated the DNA methylation status of the ESP locus. We performed bisulfite sequencing to analyze their methylation profiles in a 3179-bp genomic region consisting of 633 bp of gene body, 1545 bp of upstream region, and 1001 bp of 3′ distal sequence (Fig. 3a). We observed higher CG and CHG but not CHH DNA methylation in the downstream transcriptional termination region of ESP gene in the wild type compared with the Epi-sp mutant. All the altered methylation sites occurred in a contiguous 313-bp region at 289 to 601 bp downstream of the transcriptional termination site. This region is hypermethylated in the wild type but is demethylated in the Epi-sp mutant, spanning 26 CG sites and 13 CHG sites (Fig. 3b). To determine whether loss of DNA methylation in the transcriptional termination region (TTR) directly causes the ectopic expression of ESP in Epi-sp, we treated the wild-type seeds with 5-aza-2′ deoxycytidine (5-aza-dC), an inhibitor of DNA methylation (Chang and Pikaard 2005), to assess its effect on the expression of ESP. Transcript levels of ESP were measured in 7-d-old seedlings with or without 5-aza-dC treatment (Additional file 1: Figure S3) and found that treatment with 5-aza-dC up-regulated ESP expression (Fig. 3c). These results indicated that the DNA methylation in the 3′ end downstream sequence of ESP plays an essential role in the regulation of ESP expression. Promoter methylation is a general mechanism for suppressing gene expression in eukaryotes. Interestingly, methylation in the transcriptional termination region (TTR) is also highly correlated with gene expression, even higher than that of promoters, especially for CG methylation in rice (Li et al. 2012). In fact, the TTR of ESP gene is a CpG island, containing 29 CpG dinucleotide repeats (Additional file 1: Figure S4). Consistently, our study showed that ESP TTR hypomethylation caused induced expression of ESP in Epi-sp plants. To explore the evolutionary significance of the epigenetic regulation of ESP, we investigated natural variation in the ESP locus and its downstream methylation region (TTR) in 40 accessions of cultivated rice (Additional file 1: Table S1), representing all of the major groups of Asian cultivated rice (Xu et al. 2011). The results showed that the ESP locus is conserved in all cultivated rice accessions (data not shown). To further confirm this, we aligned the sequences of the ESP, in four known assembled rice genomes, cv Nipponbare, 93–11, MH63 and ZS97, six AA-genome wild rice, one BB-genome (Oryza punctata) wild rice and one FF-genome (Oryza brachyantha) wild rice. The ESP is conserved in the AA-genome species including cultivated rice genomes but is absent in O. brachyantha and Oryza punctata (Fig. 4a and Additional file 1: Figure S5). Consistent with this, the sequence of the TTR region of ESP is also conserved in AA-genome species including cultivated rice (Additional file 1: Figure S6), which might be important for the regulation of ESP expression. To further determine the conserved effect of the DNA methylation on ESP expression in cultivated rice accessions, we measured ESP transcript levels in four cultivated rice strains (cv MH63, 9311, ZS97 and Nipponbare). Compared with the high expression of ESP observed in Epi-sp, we observed little or no ESP expression in seedlings in all the cultivated rice strains tested (Fig. 4b). Like the pattern of wild-type cv Zhonghua11, the other four cultivated rice accessions also showed higher transcriptional levels of ESP in the seedlings treated with 5-aza-dC (Fig. 4b and Additional file 1: Figure S3). Thus, it is tempting to speculate that the occurrence of ESP predates the divergence of indica and japonica rice and the epigenetic regulation of ESP expression is evolutionarily conserved in cultivated rice. To gain insights into the possible function of the ESP, its sequence was used to search rice databases and other public databases. Interestingly, we found that ESP had high sequence identity with a putative YUCCA-like gene (OsYUCCA7, Os04g0128900) (Fig. 5a). However, the similarity between ESP and OsYUCCA7 is only restricted to a reverse-complementing region of about 300-base sequence (Fig. 5b), like a pair of sense/antisense RNA. YUCCAs are a family of important enzymes which catalyze a key rate-limiting step in the tryptophan-dependent pathway for auxin biosynthesis (Mashiguchi et al. 2011; Won et al. 2011). For most YUCCA genes of the rice genome, the mean length of coding sequences is more than 1000-bp, encoding about 400 amino acid polypeptides. In addition, we found that three predicted open reading frames (ORFs) of ESP shared no sequence similarity with any known protein (Additional file 1: Figure S7). These results suggested that ESP might be a long non-coding RNA (lncRNA) gene. Pseudogenes are usually characterized by a combination of homology to a known gene and loss of some functionality (Mighell et al. 2000). Compared to YUCCA7 gene, ESP shares very high sequence identity with OsYUCCA7, but has extremely low protein coding probability and gene expression level in cultivated rice (Fig. 4b). 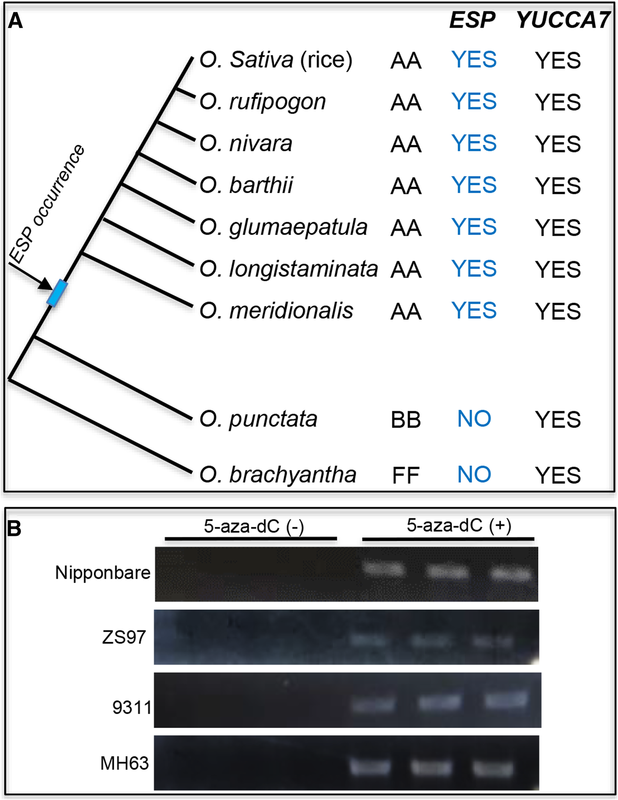 Phylogenetic analyses revealed that YUCCA7-like genes are well evolutionally conserved in AA-, BB-, and FF-genome wild rice, but ESP is absent in BB-genome (Oryza punctata) and FF-genome (Oryza brachyantha) wild rice (Fig. 4a). 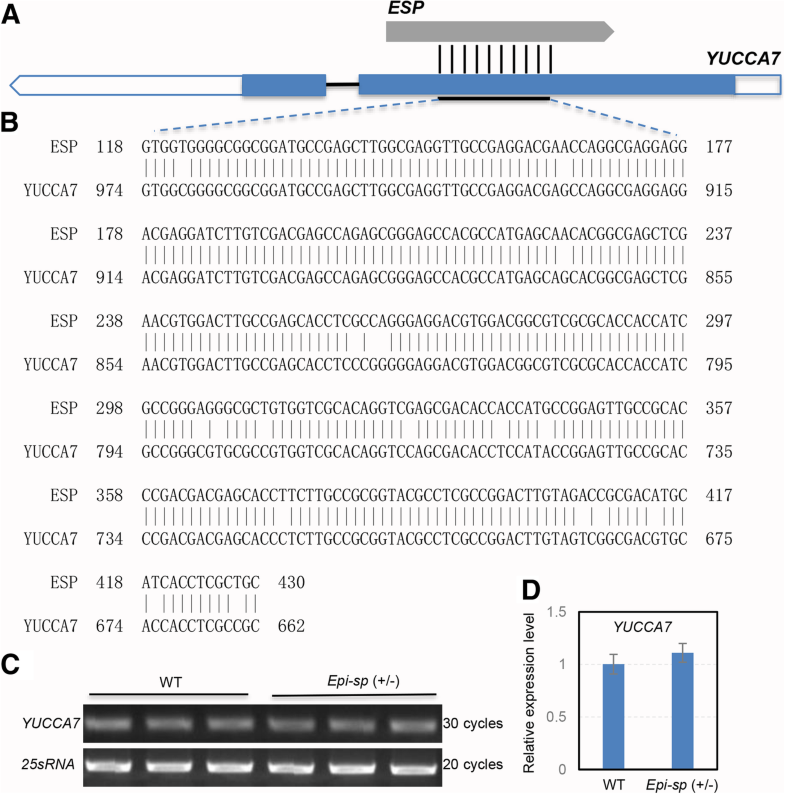 Thus, it is highly likely that ESP is the pseudogene of YUCCA7 gene. Based on the findings mentioned above, we proposed that the ESP might be a pseudogene-derived antisense lncRNA gene. Despite pseudogenes being considered as nonfunctional genomic locus, some pseudogenes may be functional, similar to other kinds of noncoding DNA, which can perform regulatory functions to their parent genes (Mighell et al. 2000). To explore the effect of ESP on its parent gene, we assessed the relationship between ESP and OsYUCCA7 expression in young panicle (3-5 cm) by qRT-PCR. Expression analysis revealed that the expression level of OsYUCCA7 in heterozygous Epi-sp (+/−) mutant was similar to that in WT (Fig. 5c, d). The result suggested that ESP overexpression probably had little effect on OsYUCCA7 transcription. However, whether ESP regulates the level of OsYUCCA7 protein production remains to be elucidated. In this study, Epi-sp mutant shows low levels of DNA CG and CHG methylation in the TTR of ESP gene (Fig. 3b), causing ectopic ESP expression (Fig. 2b) and a dense and short panicle architecture in rice (Fig. 1). It is important to point out that, although the mechanism for the spontaneous hypomethylation of ESP TTR remains unknown, the TTR of ESP gene displays the characteristic of CpG island (Additional file 1: Figure S4). Since there is no CHH methylation in the TTR of ESP (Fig. 3b), CG and CHG hypermethylation in this region is likely not established by the RNA-directed DNA methylation (RdDM) pathway. Consequently, hypomethylation of this region in the Epi-sp mutant is probably not due to loss of small interfering RNAs (siRNAs). Due to the mechanistic nature of maintenance methyltransferases, TTR hypomethylation is also likely not established by lack of OsMET1 and OsCMT3 activities in a locus-specific manner. Therefore, we speculate the epiallele is probably induced by some sort of aberrant active DNA demethylation activity. In this study, we report the identification and characterization of the rice Epi-sp mutant that displays dense and short panicle phenotype. Morphological analysis showed that the dense and short panicle phenotype in Epi-sp mutants resulted from the decrease in the length of the rachis, primary and secondary branches. The map-based cloning of ESP revealed that it encodes a putative pseudogene-derived lncRNA. Further studies to clarify the molecular mechanism of ESP should help shed light on the developmental processes underlying the formation of panicle in rice. Xin Luan and Shuchun Liu contributed equally to this work. We thank Dr. Haitao Zhu (South China Agricultural University, China) for assistance with the map-based cloning of the ESP gene. This work was supported by the National Natural Science Foundation of China (grant nos. 30900884 and 31671594 to XQ. Zhang); by Guangxi Key Laboratory of Rice Genetics and Breeding Open Foundation (No.2018–05-Z06-KF02); by Natural Science Foundation of Guangdong Province, China (grant nos. 2014A030313457 and 2015A020209118 to XQ. Zhang). XL and SL performed the experiments. SK and HD conducted fieldwork and managed the experimental materials. XMX designed the experiments and analyzed the data; TFH supervised and complemented the writing; XQZ conceived the project and wrote the article with contributions of all the authors. All authors read and approved the final manuscript.